ISEA International, founded in The Netherlands in 1990, fosters interdisciplinary exchange among culturally diverse organisations and individuals working with art, science and technology. Last seen in Sydney in 1992, the annual International Symposium on Electronic Art (ISEA) returns 21 years later to deliver another ground-breaking event. In that time, digital art has moved from the margins to become part of the fabric of everyday life. At once ubiquitous and unnoticed, resistance to electronic art has proven futile — it now lies embedded in the heart of our contemporary cultures. The symposium events will infuse the city’s social, digital and physical infrastructure. 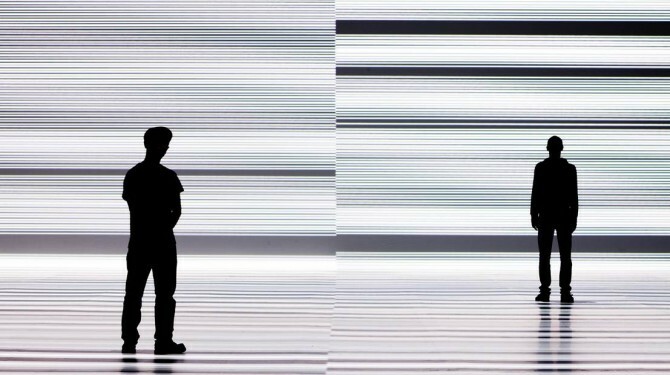 A highlight of the program is the Australian premiere of test pattern, a stunning large-scale immersive installation by renowned Japanese artist Ryoji Ikeda. Carriageworks and ISEA2013, proudly collaborating with Vivid Sydney, the Southern Hemisphere’s largest celebration of light, music and ideas, co-present test pattern at Carriageworks from 8 June until 1 July 2013. Like many of Ikeda’s electrifying works, test pattern represents the intense energies of the massive data flows that increasingly shape our globalised world. Ikeda recently staged a similar installation at The Armory in New York, described by The New York Times as a ‘sublime spectacle’ and ‘spectacular, trippy and fun’. New York Magazine described Ikeda’s work as ‘an extreme and elaborate visual and sonic environment’. In addition to test pattern, Ryoji Ikeda will perform datamatics 2.0, a one-night only event at Carriageworks on the evening of Friday 7 June 2013. This is a new full-length version of Ikeda’s acclaimed audio-visual concert. Also central to ISEA2013 is a stimulating program of artists’ presentations, creative dialogues and critical debates that will unearth the latest thinking and ideas in contemporary culture. The three-day ISEA2013 Conference will feature over 200 speakers, as well as eight 8 keynote addresses from global leaders in the fields of art, science, technology, media and communications. Topics to be discussed include emerging cultural forms such as bio-art, data representation, robotics, augmented realities and urban and virtual ecologies. The Opening Keynote address will be by Michael Naimark, a New York-based internationally renowned pioneering media artist. The conference will take place from Tuesday 11 to Thursday 13 June at The University of Sydney. Registrations for early bird discounts are available now, bookings are essential: http://www.isea2013.org/events/conference/. The ISEA2013 TALKS PROGRAM, in collaboration with Vivid Ideas, will inspire new thinking and creative paradigms through provocative speakers such as Italian media critics and hacktivists Alessandro Ludovico and Paolo Cirio, whose infamous online project Face to Facebook involved stealing 1 million Facebook profiles, filtering them with face-recognition software, and then posting them on a custom-made dating website. The ISEA2013 EXHIBITIONS PROGRAM, will showcase the works of over 150 contemporary artists from Australia and around the world in venues throughout inner Sydney, Parramatta and Campbelltown. Exhibitions include: Experimenta’s Speak To Me at the Powerhouse Museum, Catching Light at Campbelltown Arts Centre, and Running the City at UNSW Galleries, COFA. Performances and Workshops will engage and entice audiences at events including Night depot #3 at First Draft, Chip Music Festival, Breathing Monster featuring Myriam Gourfink and Kasper Toeplitz, and Theta lab featuring George Khut and James Brown. Full details of these events will be profiled on the ISEA2013 website and we’ll be announcing more program highlights in coming weeks. Visit www.isea2013.org regularly to keep up to date with developments as they arise! The full ISEA2013 program will be announced in 3 program releases. PROGRAM: Stay tuned for more program announcements. Visit www.isea2013.org and join the email newsletter list for regular updates.